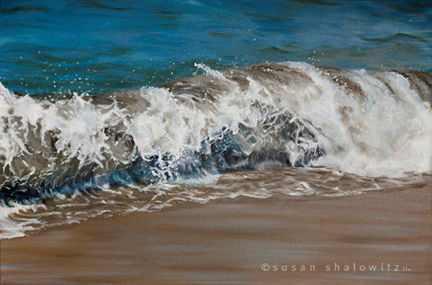 Susan Shalowitz was introduced to oil painting in 2008 when she took a workshop and began painting from her photos. Interest quickly turned into passion, and she has been painting ever since. Susan is currently studying classical painting at the Compass Atelier where she is enrolled in her third year of a three-year Master Artist program. There, she has gained a classical technical foundation and has enjoyed expanding her skill set, including learning master techniques, plein air and still life. From the start, Susan’s work has centered around her fascination with the the natural world and the ingenuity of its design. Through her paintings, she studies and shares the abundance of beauty in life’s many forms. 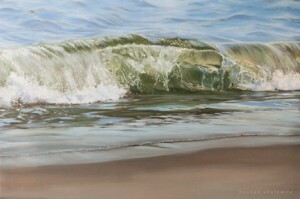 Her current body of work explores the connection we have to the ocean, in its many moods.